The random number generator chose number 38, Bogna. (Sorry, no link for the name.) Please email me (address in sidebar) with your information so that Reversible Knits can land in your mailbox. Last Sunday, I decided we needed a few new potholders around here. (Ours were looking really bad!) So, I dug out the old loom maker my grandfather made and we finished one that had been started around three years ago. Boy did that feel good. I left the loom and a bowl of the loops on the coffee table for anyone to get started when the urge hit them. It hit Andrew on Monday. My awesome grandfather made this at least 35 years ago. Super special. I imagine it's pretty easy to make one. Just need a piece of wood, some nails and a hammer. Mine measures 7 1/2 x 7 1/2 square. He nailed 25 nails in each side, pretty evenly spaced. From the looks of it, he didn't get it right the first time around. (I think the holes from his first attempt add a lot of character.) 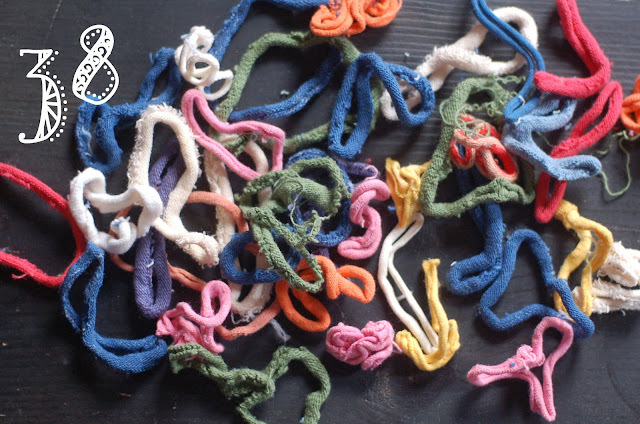 Along with the loom, I had a stash of the loops in a bag from 1976! I did a little research and you can purchase that same kind here. I have the original little directions which suggests leaving the loops on a while (the longer the better) which will make it easier to finish off and will result in a larger potholder. And, if you don't feel like making a loom, you can always buy a metal one. But, believe me, there is something SO special about making a potholder on a handmade loom. Back tomorrow with another book giveaway! Love it! The only kind of pot holders I use! I "make" my twenty something daughters make new ones every couple of years! One of my favorite things about you, Leslie, is how you leave crafts, chalkboards and other creative prompts around your house for your kids to pick up at their leisure. i love that you still have that loom. what a treasure! I've been intrigued by the Schacht pin loom lately, it makes smaller squares but seems like fun.